It’s no easy task to combine the old with the new; gamers may yearn for the good old days, but few things will turn even the most nostalgic retrogamer off like dated mechanics and tedious gameplay. Square Enix has managed to find a stellar balance of retro and modern in Octopath Traveler, delivering solid story telling along with the old, the modern, and the breathtaking. Let’s be honest: Octopath Traveler isn’t perfect. Some characters are written better than others, some of the stories are a little heavy-handed with morality, and the game requires no small bit of grinding, using turn-based combat mechanics which are not quite as snappy as some other recent titles, but it provides dozens of hours of quality entertainment inside a delightfully large world. It brought me back to my days playing Chrono Trigger, Breath of Fire III, and old school Final Fantasy titles, yet still felt fresh. Not to mention that the acronym of the character names, Olberic, Cyrus, Tressa, Ophelia, Primrose, Alfyn, Therion, and H‘aanit, is freaking cute. And it’s gorgeous. I can’t say that enough: Octopath Traveler is a breathtakingly beautiful game. I began my quest as Alfyn, the alchemist, and literally gasped during an early cutscene set upon a hill. Water sparkled in the distance, catching the light and glimmered in a way I’ve never before seen in pixel art. While not everyone has the same passion I do for the HD-2D style of art, I found myself entirely smitten with it. I’m old school in that I prefer pixel art to 3D rendering 9 out of 10 times, and this fresh approach to an old style has only served to deepen my love for pixel art. I’d often find myself running back and forth through the darkened woods of the S’warkii Trial, or across the parched landscape of the Flats, just to watch the way the edges of this pixel world fuzzed in and out of detail as I moved through the landscape, drinking in when the focus shifted, and how this small detail guided my experience as a player. While the HD-2D engine is a huge leap forward for an art style I adore and sincerely hope will now be making a comeback, there were elements of the pixel art that could have been improved. I would have loved to see just a little more detail and care going into the treatment of characters with asymmetric designs; Alfyn’s satchel jumps from one side of his body every time he turns, as does Therion’s bangle, the feather in Tressa’s hat, etc. They’re small details, but they’re details I frequently noticed; with all the love given to the pixel art of the world, I can’t help but wish that the characters guiding me through this journey had been given the same amount of care. It’s also worth noting that while the music is great, the quality of the voice acting can vary a bit. While it’s pretty great for most of the characters, it’s less so for others (I’m looking at you, H’aanat). The turn-based combat is fairly quick, and only occasionally feels tedious. Each type of enemy is weak to a certain number of spells and weapons, and by attacking those weaknesses, you can ‘break’ their shield, stunning them for a turn or two, during which they take extra damage. This, combined with a Battle Points system, allows for, and often requires, a strategic approach to combat. Every time a character does something in battle, be it an attack, a special skill, using an item, or defending, they earn one Battle Point. They can then cash in these Battle Points to chain a series of attacks, or use a more powerful special skill, unleashing a torrent of damage or healing. This means you can quickly power through a low-level random encounter, unleash holy hell on a stunned opponent, or even, in the case of Olberic, bolster your defenses for a turn, in order to survive a particularly devastating attack from a boss. Each character also has special skills, which often come in pairs, and a character specific ability. Olberic, the warrior, and H’annit, the hunter, can both challenge NPCs to a fight, but H’annit’s hunter skill allows her to capture beasts, which she can then summon to help in future battles. The shared skills feel more convenient than they do like lazy writing; it means there’s a good chance that when you need to lead an NPC away from a door, you’ll already have either Ophelia or Primrose, both of whom specialize in doing just that, in your party, reducing the number of trips you need to make to the Tavern to switch out party members. That said, thief Therion is the only party member with the ability to pick the locks on those hard-to-open treasure chests, meaning that backtracking can still be required, if you intend to unlock every chest, explore every door, and complete every quest, but the game feels like it was designed to help reduce these kids of frustrations. Also helping reduce frustrations are the fast-travel and the dual class features. The Switch’s – button became my favorite tool, as it allowed me to quickly jump from one city to the next, expediting my ability to complete quests, access new chapters, and just generally letting me avoid an unwanted slog from one side of the game’s impressively large map to the other. The ability to dual class also makes each character twice as effective and your team far more versatile, as it allows them to make use of more skills and weapons which they can use to break enemies. This also opens up a temptation to simply power-level four characters and march straight to the end of the game, something which, without diving into spoilers, I would strongly advise against. While I would have enjoyed the overall game much more had I completely ignored one particular character, I’m glad that I took the time to ensure that all eight characters were fighting fit, as it resulted in a much more enjoyable end-game experience. I was surprised to find that I was going to be tackling all eight stories in a single playthrough. Octopath Traveler gave me visions of games such as SaGa Frontier and Legend of Legacy, where each of the each main characters may have intersecting stories, but they all play out as a mostly stand alone experience. This added a lot more depth to these worlds, and allowed you to become more organically attached to characters, learning their full history after having experienced them as a party member and a side character. I expected Octopath Traveler to behave much the same way, and while it was nice not having to backtrack through certain stories, I felt this approach left the world feeling a little flatter than it could have been. The charter stories in Octopath Traveler also don’t really seem to intersect at all; they run parallel to each other, resulting in a tale of eight individuals who happen to be traveling together, rather than forming a network of interconnected tales. 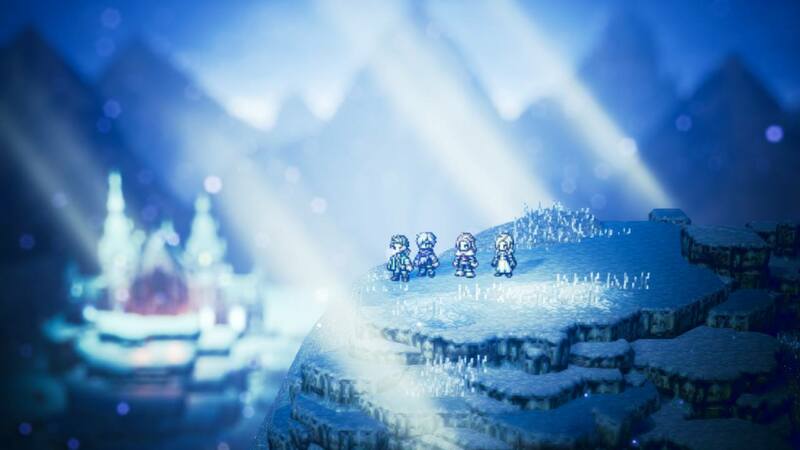 While one of Tressa and Cyrus’ chapters may take place in the same physical location, they don’t really overlap or impact the tale of the other.